The implementation of fully automated observing in September 2015, in which the telescope observes from lists of pulsars, slewing to each one, activating the data acquisition instrumentation and processing, has greatly accelerated the numbers of pulsars for which daily timing is possible. We have gone from 100 pulsars in August 2015 to 220 by late October 2015. 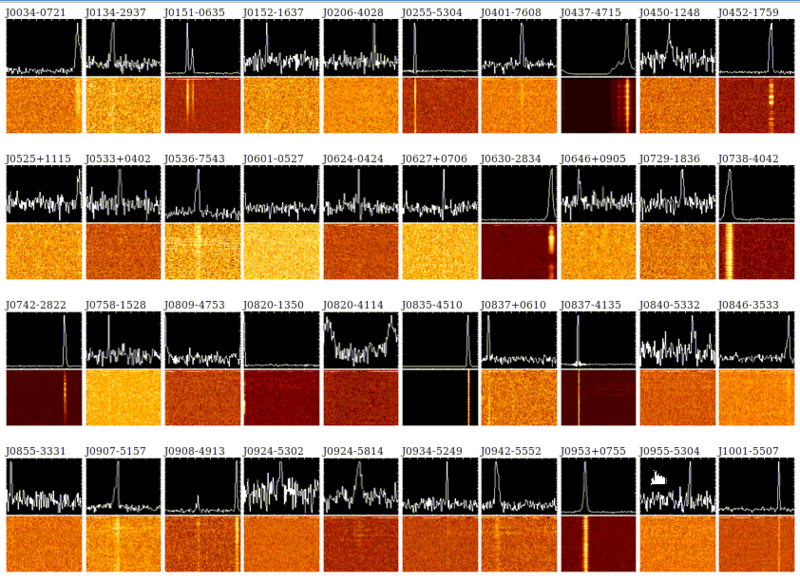 Screenshot of just some of the ~220 pulsars being timed at UTMOST (October 2015). As the telescope upgrade proceeds the number of accessible pulsars is expected to increase several fold. The final aim of the fully upgraded instrument is to time as many as 500 pulsars on a daily to weekly cadence — in a project called TIME. Pulsar timing is part of the PhD project of student Fabian Jankowski, who has been closely involved in the telescope upgrade, implementing automated observing with the telescope, and building ephemerides for the pulsars as they have come within reach of the instrument and are timed. Congrats to the UTMOST team for this significant milestone in the project!